Let's have a look at the top steam machines brands available on the market nowadays. Shark steamers will revolutionize your cleaning routine, giving you a spotless home from top to bottom. From floor mops to portable steamers, Shark's steam cleaners use patented technology to deliver impressive results. Instantly dissolve sticky messes, remove stains, and eliminate germs, for a perfectly clean, sanitized home. From the bathroom to kitchen, hardwood floors to tile and tubs, you'll love the unparalleled steam cleaning power of Shark steamers. Haan brings the incredible power of steam into your home for a natural way to clean, sanitize, and freshen almost any surface. The clever designs of Haan steam cleaners offer a greener approach to cleaning, giving you a healthier home and more time for living. Haan is the #1 name in steam cleaning worldwide, and you’ll see why – trust Haan for superior steam-cleaning results every time. Haan brings the incredible power of steam into your home for a natural way to clean, sanitize, and freshen almost any surface. The clever designs of Haan steam cleaners offer a greener approach to cleaning, giving you a healthier home and more time for living. Haan is the #1 name in steam cleaning worldwide, and you'll see why - trust Haan for superior steam-cleaning results every time. Haan steamers are expertly designed using superior quality materials and stringent manufacturing practices. In your kitchen, bathroom, garage, or workshop, from floor to ceiling and everywhere in between, there's a Haan steam cleaner for every surface in your house. Get rid of your messy mop and bucket and put away your clunky ironing board. Haan offers durable, superior-quality steamers that make it easier than ever to clean, sanitize, and freshen your entire home. McCulloch heavy-duty steam cleaners are a must-have for your garage or workshop. These innovative steamers are designed to tackle the toughest messes on everything from engines to upholstery, BBQ grills to golf clubs, chrome details to patio furniture. Cleaning with powerful steam is safe, easy, and effective – you’ll eliminate grease, stains, odors, and germs using only water, so you can stop cleaning with harsh, damaging chemicals. 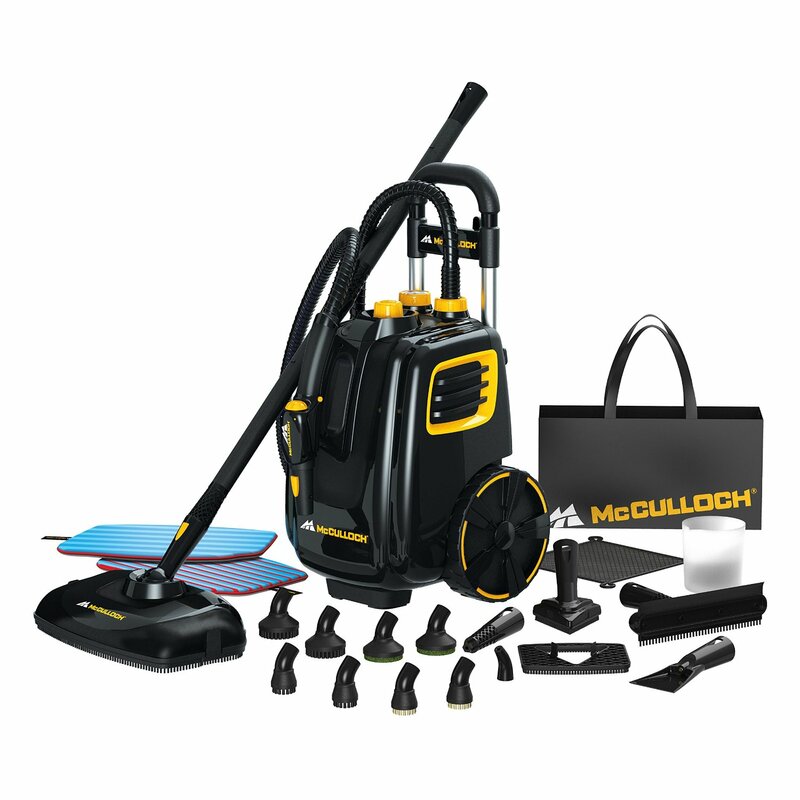 McCulloch multi-purpose steamers are portable, affordable, and will make every surface in your garage, shop, and beyond sparkling clean in no time flat. Steamfast steam cleaners are designed to offer the most innovative, effective features at the most affordable prices. Cleaning with steam is the ideal solution for any home because steam eliminates dirt, stains, and bacteria using only safe, natural water. From dirty floors to dingy bedding, sticky countertops to scummy bathroom tiles, the Steamfast line of steam cleaners does it all. You'll be amazed at the effortlessly beautiful results! The Oreck Steam-It steam cleaner goes where no steamer has gone before! The Oreck Steam-It uses an innovative pressurized "dry" steam system to dissolve dirt, eliminate germs, and clean your home from top to bottom. The one-of-a-kind Oreck Steam-It is a versatile steamer that easily cleans from floor to ceiling. Effortlessly remove dirt, spills, and stains from virtually every surface in your home. Steam cleaning is the fastest, safest way to clean your home because you eliminate dirt, bacteria, and stains without harsh, toxic chemicals. The Oreck Steam-It takes the steam cleaning revolution to the next level with a lightweight, portable design that quickly, easily, and safely cleans and sanitizes every surface of your home. It's never been so easy to get your home floor-to-ceiling clean. The Vapamore® MR-100 Vapor Steam Cleaning System is the ultimate in versatile steam cleaning. This multipurpose vapor steam cleaner brings the professional cleaning power of steam to your home, so you can clean and sanitize without harsh chemicals. The Vapamore® complete vapor steam cleaning system provides an unsurpassed deep-clean for virtually every surface of your home, garage, and beyond. The Vapamore® Vapor Steam Cleaning System utilizes the best features of high-priced commercial steam cleaners, producing the optimal clean from an affordable home unit. Created for quick, effective home use and endless cleaning possibilities, the Vapamore® Vapor Steam Cleaning System easily tackles every imaginable cleaning problem. You know Dirt Devil for their superior quality vacuum cleaners, but you'll also love the new Dirt Devil Easy Steam line of steam mops and accessories. These innovative floor steamers absorb messy spills, scuffs, and stains and using only tap water, leaving floors sparkling clean and dry. With sturdy construction and innovative features, the Dirt Devil Easy Steam floor mops and accessories will soon become your favorite way to get brilliantly clean floors, effortlessly.